Global business and IT consulting company, NEORIS, was searching for a cloud-based communications system after finding out that their current tool provider was going to require them to move to a new licensing scheme to maintain service. 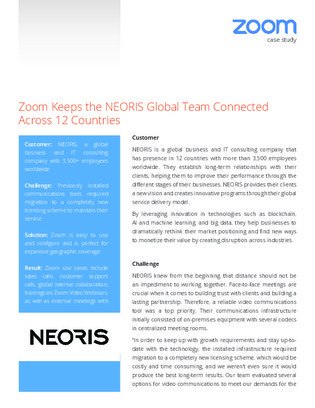 After some searching, NEORIS decided to implement Zoom, which provided them with a versatile cloud communications platform, that could easily be used for large geographic coverage and incorporating users outside of the company. In this case study, learn how Zoom helps provide an audio and video experience, even in low bandwidth environments, and see what benefits NEORIS has experienced since upgrading.